You are at:Home»Focus»TURKEY- Dazzling Conquests of Turkey! If you followed the Turkish press in the recent month, only from reading the newspapers’ headlines and without going into the details, you might have thought that Turkey conquered one territory after another and greatly extended its land. Thousands of Turkish nationalists head for Kirkuk! Kirkuk and Mosul are being announced as the new provinces of Turkey. 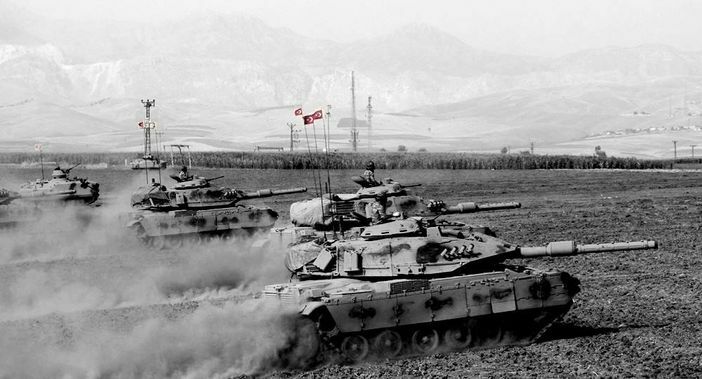 Turkish Armed Forces are continuously launching operations; next thing you know, the army enters Iraq and three days later, exits through Syria! The speed of the conquests is dazzling! If you wonder and look at one of the constantly updated maps on the internet that show the military movements, you can instantly notice that in reality, almost nothing happens and everybody (especially Turkey) makes no headway. What happens is precisely what has been going on in Turkey over the last 15 years: futile nationalism exaggerated as far as possible but totally meaningless. The decision of the referendum taken by Iraqi Kurdistan for independence (25th of September 2017) brought up the concept of “National Oath” (Misak-ı Millî), which is already on the agenda. When being considered in historical perspective, having a different definition, “National Oath” is used today as “the borders of Turkey desiring to be Turkish”. In the past, acting more conscientiously, there were expressions such as “Mosul, the land of National Oath that is outside Turkey”. At a recent speech he made, Devlet Bahçeli, the chairman of the Nationalist Movement Party (MHP) of the opposition, who gladly supported the nationalist policies of the president Erdoğan in the last couple of years, made a definition by extending the borders of “National Oath” including “Batumi, Aleppo, Raqqa, Deir ez-Zor, Idlib, Sulaymaniyah, Mosul and Kirkuk”. Nationalist-conservative Turkish policy has dreamed of “restoring the Ottoman Empire, expanding and reclaiming its lands” for years. Although voters and politicians had been living with these dreams, those who shaped the foreign policy of Turkey were a group of bureaucrats who were able to think free of these dreams, relatively realist and obsessive about the territorial integrity of the country; until Tayyip Erdoğan seized power. With the great support of voters behind him, Erdoğan changed the perception of foreign policy, just like every other thing, in the direction of his own desires and beliefs. Turkey had become so powerful with Erdoğan that it was not possible to hold it within its own borders! Erdoğan was not only the hero of his own voters, he was also the hero of the whole world of Sunni Islam. It was time to lead all Muslims and to establish the new Ottoman Empire. In a speech he made in 2013, key advisor to President Erdoğan and one of the closest name to him, Yiğit Bulut, had said that Northern Iraq was going to have a referendum in 2 or 3 years and would join Turkey (he wasn’t saying this to deceive his voters, he also was believing in it and probably made Erdoğan believe it). Today, Turkey is looking for remedies for its southern borders not to be surrounded by Kurds. Erdoğan said that the “Euphrates River is our red line, the PYD [the Syrian-Kurdish party, linked to PKK, controlling North of Syria] will not cross the Euphrates River”; on the other side, on the western side of the Euphrates, Manbij is under the control of the Syrian Democratic Forces (SDF – mainly the YPG, armed arm of the PYD) since months and Erdoğan can not do anything. With the operation of the “Euphrates Shield” performed by the Turkish Armed Forces with great hardships and casualties, Turkey barely took control of Al-Bab. The Syrian Democratic Forces, which acted at the same time, had to give up the dreams of maybe uniting the Kurdish cantons of Rojava (the “Syrian Kurdistan”), but despite all the objections from Turkey, with the support of USA and Russia, they control an important part of the lands between Afrin and Kobane. With the latest move of Idlib by Turkey (beginning of October 2017, Erdogan launched an operation against al-Nosra Front in Idlib), new futile nationalist discourses have been added lately. Nationalist press in Turkey announced quite small-scale military activity as if the Turkish army went for conquests. However, by looking at the map only, a rational person would understand that the operation was made to inhibit Syrian Democratic Forces in Afrin to advance to Idlib in the future. Just because it would be a situation that Bashar al-Assad and Russia would not desire – obviously the Turkish were given permission to go north of Idlib, provided that Turkey would not come down south any further. But if you look at the political discourses and the press in Turkey, the aim is to besiege Afrin and the next target clearly is Afrin! In the last couple of years, there has been a boom of TV series and motion pictures that address nationalists. In reality, while no steps are taken without the permission of USA and/or Russia, if you consider the films, even the whole world becomes helpless in the face of a Turk. In 1974, the government of prime minister Bülent Ecevit prevented Cyprus to be occupied by Greece, by having taken the risks of embargos, the price Turkey had to pay. Can Erdoğan do the same? Can he perform an operation to Afrin and/or Manbij facing USA completely? Can he say “I told them they couldn’t cross the west of the Euphrates River, I don’t allow my word to be violated, I am doing what is necessary”? Is it possible for Erdoğan to take the risk of an economic crisis that would shake his rule, in order to make a foreign policy movement to defend Turkey’s interest? Can Erdoğan face losing his rule for Turkey’s interests? In the next days, Turkish nationalists will continue running from victory to victory in the movies, the headlines of the newspapers and the political speeches just like before. And the whole world will keep on watching Turkey with envy!